is getting recent, long-overdue attention. But these conditions are not limited to Northeast Wisconsin, as the US EPA showed up in Central Wisconsin last week and began digging a huge number of test wells to track down the source of well water contamination there. 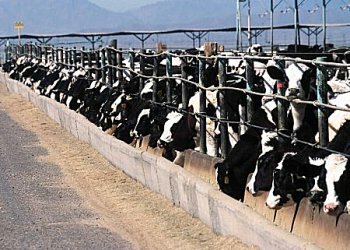 The farm in question, Central Sands Dairy in the Town of Armenia, is a concentrated animal feeding operation, or CAFO, with a permit to manage more than 6,000 cattle, state records show. or unwilling to stop it. The owners of that dairy are major Walker donors - - noted also in this summary posting - - and have been stymied in their efforts by local activists, officials and litigation to build another large concentrated animal feeding operation, or CAFO, in Wood County. Given Walker's laissez-faire approach to DNR management and on-site inspections, weak laws approved by a Legislature obeisant to Big Ag and Big Dairy and continuing expansion of CAFOs while small farmers fail, it's going to take a cleansing blue wave to drastically reduce the brown water events. Kevin Masarik, integrated specialist with UW Extension in the College of Natural Resources – University of Wisconsin Stevens Point will deliver results. And the grassroots group Kewaunee Cares has a powerful website, too.